GROWTH AT LONG BEACH TERMINALS WAS LED BY PIER T: Terminal Investment Limited, a subsidiary of Mediterranean Shipping Co., purchased a majority stake following the bankruptcy of Hanjin Shipping last year. POLA’s 826,640 TEU were a 17.4-percent increase over last January’s record. Exports at POLB jumped 10.8 percent in January to 118,234 containers. Imports at POLB increased 7.4 percent to 298,990 TEU. The Port of Long Beach, which has suffered poor traffic numbers in recent months saw renewed activity at its largest terminal and extra ships calling ahead of the Lunar New Year to push cargo 8.7 percent higher in January compared to the same month a year ago. Dockworkers moved 582,689 TEU last month. Exports were strong, jumping 10.8 percent year-over-year to 118,234 containers. Imports increased 7.4 percent to 298,990 TEUs, while empties sent back to the Far East rose 9.6 percent to 165,465. Across the bay, the Port of Los Angeles, which has been showing much better numbers than its neighbor of late, handled 826,640 TEU in January 2017, an increase of 17.4 percent compared to January 2016. 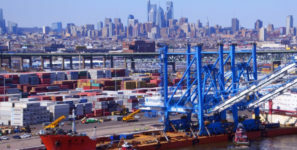 It was the busiest January in the port’s 110-year history, outpacing last January, which was the previous record for the first month of the year. It was also the second-best month overall for the Port, eclipsed only by last November’s 877,564 TEUs. Long Beach’s woes, especially in the last quarter of 2016, were attributed to the los of business resulting from the collapse of the South Korean shipping line Hanjin, which called at the Port of Long Beach. Growth at Long Beach terminals was led by Pier T, operated by Total Terminals International (TTI). The terminal is now controlled by Terminal Investment Limited (TIL), a subsidiary of Mediterranean Shipping Co. (MSC), the world’s second-largest ocean carrier. MSC’s TIL purchased a majority stake in the terminal following the bankruptcy of Hanjin Shipping last year. The month’s total container traffic growth was notable since TEU traffic in January 2016 jumped 25 percent from the same month in 2015. The January surge in Los Angeles was due in part to retail stores replenishing inventories after the holidays, a trend of increased U.S. exports and cargo ships calling ahead of the Lunar New Year, when goods from Asia slow down considerably. Over the most recent 10-year period, January volumes at the Port of Los Angeles have averaged 645,142 TEUs. January 2017 imports increased 13.1 percent to 415,423 TEUs compared to the previous year. Exports surged 28.7 percent to 162,420 TEUs in January. Total loaded imports of 577,843 TEUs increased 17.1 percent compared to the previous year. Empty containers jumped 17.9 percent to 248,797 TEUs. Combined, January overall volumes were 826,640 TEUs, a 17.4 percent increase compared to last year. With new alliances beginning this spring, 2017 is expected to be a transition year for the industry. “Long Beach stands ready to provide a dependable harbor as carriers adjust to new services, while we continue upgrading our berths and rail network to speed their cargo inland,” said Port of Long Beach Interim Chief Executive Duane Kenagy.